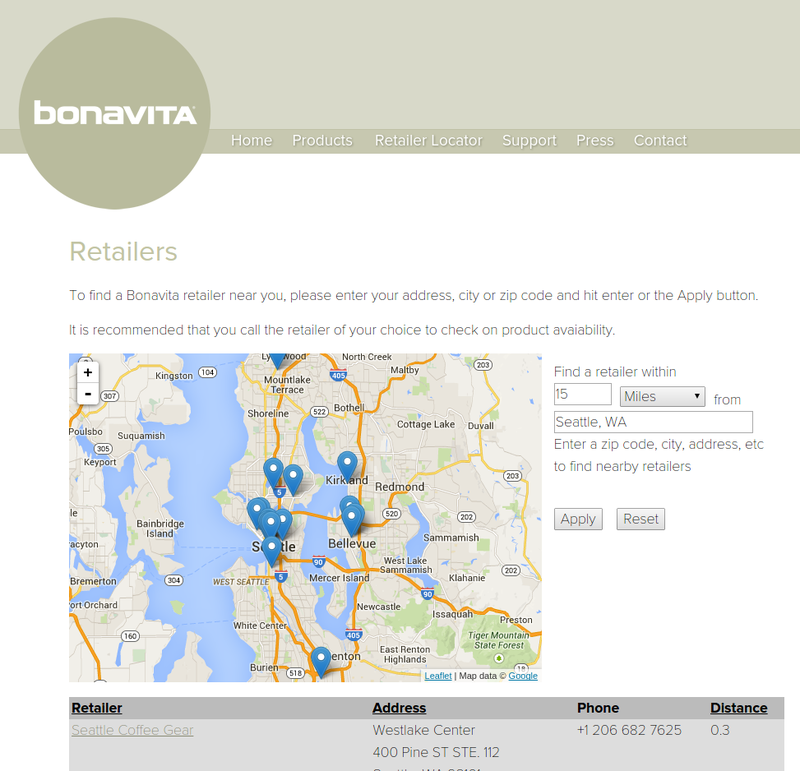 In early 2014, our friends at Bonavita came to Freelock requesting that we help manage their main website Espresso Supply. Soon thereafter, they wanted to launch a website for one of their brands, Bonavita. But it wasn't until early summer that they were ready to realize those dreams. Freelock started with some planning and used our Basic Business Site to get them a nice base package. We then added some awesome custom functionality! We embedded a retailer locator map that includes filters for address, city, and zip. It locates product retailers within a specific vicinity, lists their location, phone number and distance from you. We also created a data import tool that will allow Bonavita to upload new data to the retail locator -- especially since they have international retailers! It is easy to use, fast and effective. Best of all, they don't have to rely on developers to upload this data to their database. Their entire site is responsive and mobile friendly. There are a bunch of theming touches that we made across the site, including the accordion style product support page, but many that are out of the box with our Basic Business Site package. We encourage you to check out their site, as we are still collaborating with them on more site improvements!